What do I need to know about my new Medicare card? Question: What do I need to know about my new Medicare card? Answer: The Centers for Medicare and Medicaid Services (CMS) is mailing new Medicare cards to all 57.7 million Medicare beneficiaries (starting back in April 2018) and will continue through April 2019*. Look to see if you have received a plain white envelope from the Department of Health and Human Services. If you did not receive your card, please call Medicare at 1-800-Medicare (1-800-633-4227). The call center representative can check the status of your new card. Be sure to verify your mailing address for accuracy. You can sign in to your secure MyMedicare.gov account to see your Medicare Number and print your official card. If you do not have a MyMedicare account, you can sign up at MyMedicare.gov. While you are waiting for your new Medicare card, you can continue to use your current Medicare card for health care services. As noted by CMS, "[t]he new [Medicare] cards will use a unique, randomly-assigned 11-[character] number called a Medicare Beneficiary Identifier (MBI), to replace the Social Security-based Health Insurance Claim Number (HICN) currently used on the Medicare card." 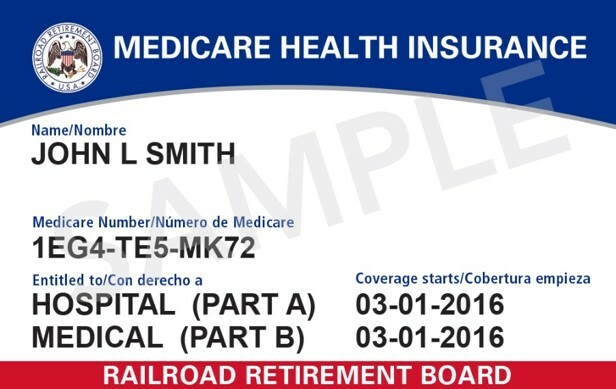 CMS also noted that the new Medicare card initiative "will prevent fraud, fight identity theft and protect essential program funding and the private healthcare and financial information of our Medicare beneficiaries." New Medicare Card, Same Medicare Benefits. Your new Medicare card will not affect or change your Medicare Part A or Medicare Part B benefits. Your Medicare Part A and Part B effective dates printed on the new Medicare card ("Coverage Starts") will not change. The 11-charecter Medicare Beneficiary Identifier (MBI). Your new Medicare card is printed on paper, the size of a credit card, and will have a new 11-character Medicare "Number" or Medicare Beneficiary Identifier (MBI). You will notice that your new MBI "number" is actually alphanumeric or having both upper-case letters and numbers (from the sample graphic above you can see "1EG4-TE5-MK72") - to avoid confusion, the MBI will exclude the letters:"S, L, O, I, B, Z" (since these letters are easily mistaken for numbers). Your Unique and Random Number. Your new Medicare card will have a number that is unique to you - but, there is no meaning to the number. Remember, you will have a different number than your spouse. No more Social Security numbers. Medicare is removing the 9-digit Social Security Number from these new Medicare cards (from the sample original Medicare card graphic above we had the Social Security Number "000-00-0000"). No more gender, no more signature. The new Medicare cards will no longer include your gender and your new Medicare cards will not have a signature line. Helping you to fight against identity theft and more. The new Medicare card will help protect your identity (prevent identity theft) and, as noted above, fights fraud, protects "essential program funding and the private healthcare and financial information of our Medicare beneficiaries". Important: Confirm your mailing address. Please make sure that your mailing address is up-to-date by calling the Social Security Administration at 1-800-772-1213 (TTY users 1-800-325-0778) (Monday through Friday, from 7 a.m. to 7 p.m.) or visit https://ssa.gov/myaccount. Look for your new Medicare card in the mail. CMS will automatically mail you a new Medicare card - you do not need to take any action. Below is the CMS Medicare card mailing schedule and, as you can imagine, mailing new Medicare cards to 57.7 million people will take some time, so be sure to have some patience. CMS will begin mailing new Medicare cards April 2018 and continue through April 2019. -- New Medicare ID cards are currently being sent to Medicare beneficiaries in "Wave 3": Arkansas, Illinois, Indiana, Iowa, Kansas, Minnesota, Nebraska, North Dakota, Oklahoma, South Dakota, Wisconsin. -- Medicare has also begun to send Medicare ID cards to residents of "Wave 4": Connecticut, Maine, Massachusetts, New Hampshire, New Jersey, New York, Rhode Island, and Vermont. Update 04/05/2018 - New Medicare cards will be sent to people who are newly eligible for Medicare starting April 2018. New Medicare cards will be sent to existing Medicare beneficiaries starting May 2018 - instead of April 2018. Begin using your new Medicare card at once. Once you receive your new Medicare card, CMS recommends that you destroy your old Medicare card, and immediately begin using your new Medicare card. Important: Keep your personal information secure. Again, be sure to protect yourself by destroying your old Medicare card in a way that no one can get your personal information. If you are enrolled in a Medicare Advantage plan (MA or MAPD) like an HMO or PPO, you will continue using your Medicare plan's Member ID card just as you do now. Keep your new Medicare card safe, but carry the new Medicare card with you in case a healthcare provider asks to see it. Members of stand-alone Medicare Part D plans. If you are enrolled in a stand-alone Medicare Part D prescription drug plan (PDP), you will continue using your Medicare Part D plan's Member ID card for your prescription drug coverage. Please also carry your new Medicare card with you for evidence of your Medicare Part A and Medicare Part B coverage. -- As emphasized by CMS: "Guard your Card". Protect your new Medicare card the same way you protect a credit card. -- "Only give your new Medicare Number [MBI] to doctors, pharmacists, other health care providers, your insurers, or people you trust to work with Medicare on your behalf." -- Important: Remember, your Medicare card will be sent to you automatically and you do not need to pay for your new Medicare card. Railroad Retirement Board (RRB) beneficiaries will also have a new card with the RRB logo. * The Medicare Access and CHIP (Children’s Health Insurance Program) Reauthorization Act (MACRA) of 2015 requires CMS to remove Social Security Numbers (SSNs) from all Medicare cards by April 2019. 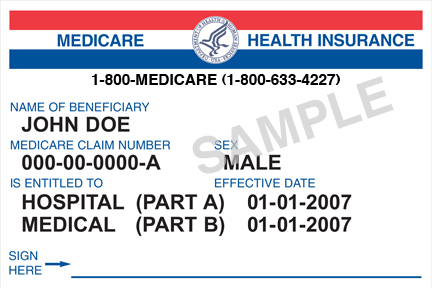 A new Medicare Beneficiary Identifier (MBI) will replace the SSN-based Health Insurance Claim Number (HICN) as the identifier on all Medicare cards.